Preheat the oven to 220 degrees Celsius/ 430 degrees Fahrenheit. Scrub the beetroots very thoroughly, dry them and cut them into wedges. 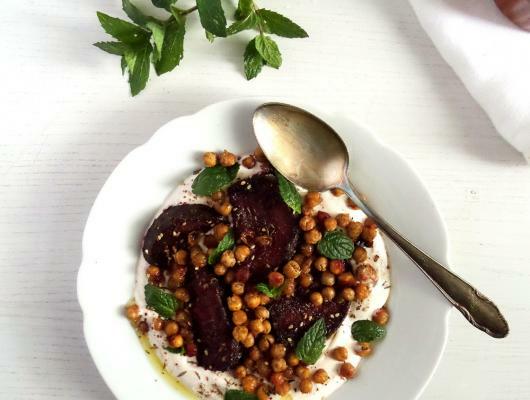 Spread the drained chickpeas and the beetroot wedges on a large baking tray, add the olive oil and mix well with your hands. In a small bowl mix together the sumac, cumin, thyme, sesame seeds and salt. Add half of this mixture to the beetroots and the chickpeas and mix again very thoroughly. Roast for about 25-30 or until crisp at the edges. Check towards the end of the roasting time, so that the chickpeas will not turn black. They should be nicely crisped and the beetroots should be a bit softer, but not really soft or mushy, they should still have quite a strong bite. In the meantime mix the yogurt with the lemon juice and zest and about 1 teaspoon of the remaining spice mixture. Swirl the harissa through and spread the yogurt on a serving platter. 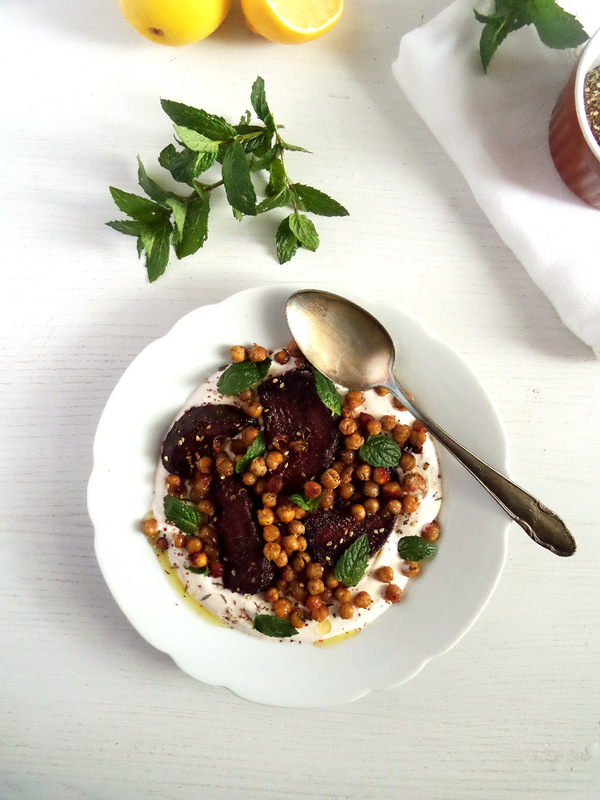 Top with the beetroot wedges, chickpeas and mint leaves. Drizzle a little olive oil on top and sprinkle with a pinch of the spice mixture. Enjoy with some crisp bread.